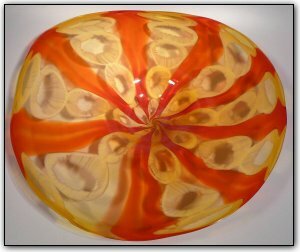 This very large wallbowl features shades of red-orange and gold topaz, and measures over 2 feet wide! The red-orange sections are made from hand pulled canes, which is a time consuming two-stage process. First Dirwood hand pulled the canes, then he made the bowl using those canes. Then the gold topaz sections feature various shades of gold topaz murrini, which is a three stage time consuming process. First Dirwood hand pulled the canes used to make the murrini after which he cut the canes into the individual murrini pieces, then he used the murrini to make patterns on the glass as he made this truly one-of-a-kind wall bowl.